356 mm/50 Mk74 х 3 pcs. 127 mm/51 Mk712 х 1 pcs. 12.7 mm Browning M2 mod. 212 х 1 pcs. 20 mm Oerlikon Mk43 х 1 pcs. 40 mm Bofors Mk34 х 1 pcs. New Mexico — American Tier VI battleship. The ship belonged to the generation of conventional battleships in the U.S. Navy. The main battery guns were concentrated in the ship's front and aft ends and were placed in superfiring turrets, which would soon become the standard. The battleship was armored according to the "all or nothing" concept, with the citadel being reliably protected and located in the center of the hull. New Mexico is the very definition of the "US Standard Battleship" type. Slow and heavily armored, New Mexico has the advantage of possessing twelve rifles for her main battery - a feature only matched by Fuso until Tier X. New Mexico is exceedingly proficient at short range combat, but requires foresight and planning because of her slow speed. Players are well advised to be careful when positioning themselves as New Mexico can easily be caught overextended. Good main battery firing angles. Respectable anti-aircraft protection for Tier VI. Tight turning radius for a battleship. The main battery has twelve barrels. Good concealment for a battleship. Slot 2: Damage Control System Modification 1 ( ) lessens fire damage taken. Slot 3: Artillery Plotting Room Modification 1 ( )* will increase range and give secondaries a slight boost in range and accuracy. Slot 4 Steering Gears Modification 2 ( ) allows for a faster rudder shift to better dodge incoming fire. Because US battleships tend to have excellent anti-aircraft suites and poor secondary batteries, captain skills which increase the defensive abilities of the ship are recommended. Players should consider using premium consumables in the following order of priority: Damage Control Party ( ), Repair Party ( ), and Spotting Aircraft ( ). 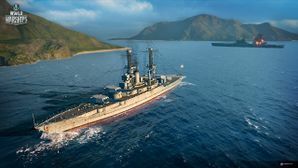 Players who wish to spend doubloons can equip New Mexico with Type 16 camouflage which reduces service costs, lowers her detection radius, reduces the accuracy of incoming shells, and increases the amount of experience she earns. Economic signals are left to the discretion of the player. The following recommendations are for combat signals only. The twelve-gun main battery of the preceding Pennsylvania class was retained, but with longer 14-inch (356 mm) 50 caliber guns in improved triple turrets. Hull design was also upgraded with a 'clipper' bow for better seakeeping and a sleeker look. One ship, the New Mexico, was fitted with turbo-electric propulsion. Though eight secondary batteries were located in extremely wet bow and stern positions and were soon removed, the rest of the ships' 5-inch (127 mm) guns were mounted in the superstructure, a great improvement over earlier U.S. Navy battleships' arrangements. New Mexico is depicted in modernized condition. Her original 1918 configuration is not represented, having been removed in a previous update. Permanent camouflage represents New Mexico as she appeared in January 1942, painted in Measure 12 (modified). However, her AA should include four quadruple 1.1" guns and eight single 20mm Oerlikons. Both hull modules have fictional AA suites. Aircraft catapult on turret #3 is missing. All of her quadruple 1.1" (28mm)/75 guns are missing. New Mexico had four in total from January 1942 to October 1943. All of her quad 40mm Bofors guns are also missing. They were first fitted to New Mexico in November 1942. She had ten quad mounts in total, supplemented by another two twin mounts. New Mexico had a total of 43 single 20mm Oerlikons; 40 are missing and she never carried twin mounts. Hull (A) should have four 3" (76mm)/50 caliber guns as part of her AA suite. New Mexico as she appeared in the 1920s. New Mexico in Pearl Harbor, 1930s. New Mexico in Puget Sound, 1943. Her camouflage is Measure 11. USS New Mexico off Kiska Island in the Aleutians, 1943. Battleships Idaho, New Mexico, and Mississippi at Pearl Harbor, December 1943. A view of the 5"/25 dual purpose secondary guns on New Mexico, 1944. Colorized photo. 14 inch shells being loaded aboard New Mexico, 1944. The presence of sailors provides an easy reference for scale, demonstrating the size of the shells. Colorized photo. New Mexico engaged in bombardment during the invasion of Guam, 1944. Note the impact of the pressure wave as visible on the ocean surface. Colorized photo. New Mexico maneuvering with other battleships, 1945. Colorized photo. Photo taken immediately after a Kamikaze impact on New Mexico, 1945. This page has been accessed 88,192 times.